Each year, there are more than 250 million golf balls that are lost on the golf course. For this reason, millions of dollars are also wasted by golfers in the same manner. When someone goes to retrieve a lost golf ball, they could find every brand such as the high end costly ones in pretty mint condition or a banged up golf ball. There is no way that you would walk onto a golf course with a small hat or a longer than normal golf club. You would try to find a golf ball that suits your needs, right? With the right golf ball, you would have more confidence in your golf play, using your talent to improve your swing speed and your golf handicap. The Rope It golf training ball is designed specifically for golfers with a need to practice on a regular basis, but have only a limited time and space to do so. With the Rope It golf training ball, you get to practice your golf swing anytime you want. You have the chance to improve your golf game in the comfort of your backyard, no matter what the size. For your convenience, this golf training ball is portable and very lightweight. This means that you can take it with you to the park, on a playing field and on the golf course prior to starting your golf round. This golf training ball is not like any hitting net. When you hit this ball, you can watch it flying across a 20 yard path. This allows you to notice your hook and your slice after hitting the ball. If the ball is struck well, you will see it flying straight across as you listen to the fast snapping sound. The Rope It golf training ball is the ideal ball for practicing your golf game. It is uniquely designed with a certain combination of calibrated nylon rope and bungee cord. Each unit of this golf ball is handmade by manufacturers in the United States. It has a durable build to last for a long time. Golfers use this training ball to increase their level of skill, taking advantage of its use during golf practice while at home or on the playing field. When the ball is struck, it returns in half the distance and feels like you are using a real golf ball on the course. 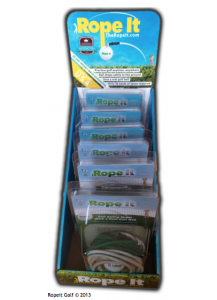 The Rope It golf training ball is easy and simple to use. You don’t have to worry about hitting your neighbor’s house or losing your ball to the streets. You can hit the ball in confidence that no driver will be yelling at you because you hit the ball in the path of a moving vehicle. You just strike the golf ball after your desired pivot, getting a full swing and improving your performance in a limited space. When you get out on the golf course, can you imagine what your golf swing will be like? It is time then to get your very own Rope It Golf Training Ball from That Training Ball. Do it today!